Is there an Internet Site for converting and displaying color values? Quantification of color is defined by a colorimetric color scale expressed by 3 numbers such as L* (lightness); a* (redness/greenness), b* (blueness/yellowness). If you have the color expressed with any colorimetric scale, you can switch to any other 3 number scale within the same illuminant/observer combination i.e. D65/10° or C/2°.If you want to change from a color scale like CIE L*, a*, b* D65/10° to CIE Y, x, y D65/2°, then you need to have the original measured spectral data for the color. 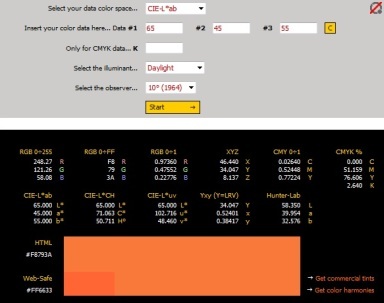 HunterLab’s EasyMatch QC software allows for hand entry of color and spectral data, display of multiple color scales and a rendering of the color in the Color Rendering View. Another option is a full-featured graphics program such as Adobe Photoshop which can be used create a rendered color to measured color values. In Adobe Photoshop, select File/New and create an image space with the mode set to L, a, b. 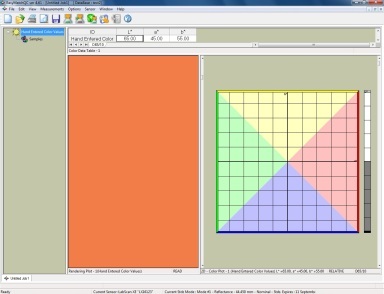 Then select the background color and enter the L*, a*, b* values in the Color Picker for the measured color. The EasyRGB web site has a color calculator for multiple color scale conversions and visual display of color values.Please note one concern. Most current monitors render screen colors well, and can be further optimized through screen calibration. However, a flat screen display of measured color values on a screen remains a visual approximation of the material color. It does not have the same appearance characteristics as the actual product.